Introduction: To investigate the levels of human tumor necrosis factor-α (TNF-α) and transforming growth factor β1 (TGF-β1) in gingival crevicular fluid (GCF) during canine retraction movement using elastic chains and closed coil springs. Materials and Methods: One hundred patients (49 men and 51 women; mean age, 23.6 years) entering the space closure phase of fixed orthodontic treatment participated in this research. An upper canine of each patient was retracted using an elastic chain, and the contralateral canine was retracted using a closed coil spring. GCF samples were collected from the canine before and 7 days after the force was applied. human TNF-α and TGF-β1 were determined by enzyme-linked immunosorbent assay. Results: There were significant increase in the concentrations of both TNF-α and TGF-β1 at 7 days in both groups (P < 0.05). In the evaluation of between-group differences, significantly higher values were determined in the closed coil spring group. Conclusions: The results suggest that closed coil springs give higher TNF-α and TGF-β1 concentrations as compared to elastic chains, which make more bone remodeling to occur; therefore, closed coil springs can be considered as the treatment of choice for orthodontic canine retraction. The main objectives of orthodontic treatment are to improve malocclusion and achieve correct occlusion and dentofacial function. Orthodontic treatment often involves the extraction of premolars followed by space closure. Canine retraction is one of the most time-consuming stages of premolar extraction-based orthodontic treatment. Any procedure which reduces the time required to perform this stage will also serve to shorten overall treatment time. When space closure is performed via sliding mechanics, the most commonly used methods of applying the force are elastic chains and closed coil springs. Elastic chains have the potential disadvantage of a significant force decrease over the time., Closed coil springs are relatively more expensive to use, but there is almost no decrease in force during the movement of teeth. Gingival crevicular fluid (GCF) is an osmotically mediated inflammatory exudate present in the gingival sulcus. During inflammation, the region tends to increase in volume and exhibits increased capillary permeability. Various studies have attempted to clarify the molecular mechanisms affected by canine retraction by performing the biochemical analyses of GCF. The results were inconclusive with either significant, or insignificant changes. Therefore, the aim of this study was to evaluate the changes of human TNF-α and TGF-β1 levels in GCF during canine retraction movement and to compare the expression of these markers between the use of elastic chains and closed coil springs. The samples were obtained from patients attending for orthodontic treatment at the Prof. Soedomo Dental Hospital, Universitas Gadjah Mada, Indonesia. A total of 100 patients (49 men and 51 women; mean age, 23.6 ± 4.9 years) were enrolled and selected to participate in this study, based on the following inclusion criteria: had upper premolar extraction in each quadrant (no other extraction), were undergoing orthodontic treatment using a Roth prescription preadjusted edgewise appliance (0.022″, Forestadent, German), and had an 0.018″ stainless steel working archwire in place for at least 4 weeks. Participants were excluded if they were smokers, had gingivitis, had probing pocket depths ≥4 mm, had loss of clinical attachment ≥2 mm in the selected or adjacent teeth, or had taken anti-inflammatory medications within the previous 6 months. Before the beginning of this study, the selected volunteers had been informed of the objectives of the study, and they indicated their agreement to participate by signing an informed consent form that had been approved by the Ethical Committee of UGM (No. 001134/KKEP/FKG-UGM/EC/2017). The volunteers were then subjected to a supragingival prophylaxis and were given oral hygiene instructions to follow at home as a procedure to eliminate inflammation. 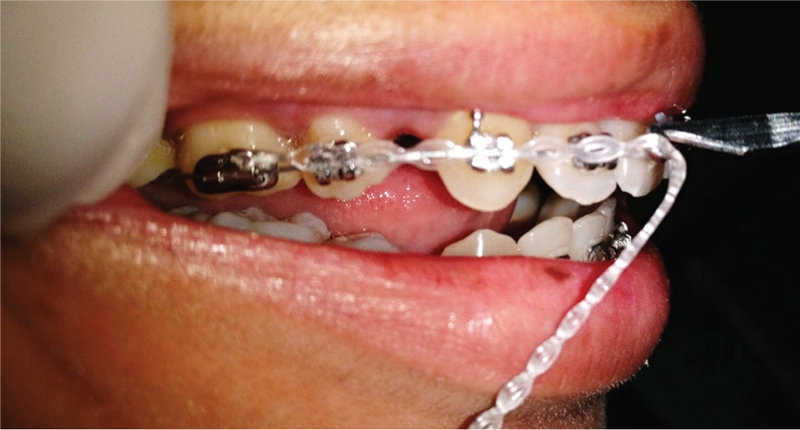 For each volunteer, one randomly selected upper canine was retracted using a short clear colored polyurethane elastic chain (American Orthodontic, USA), and the contralateral canine was retracted using a 9 mm Nickel-titanium closed coil spring (American Orthodontic, USA) [[Figure 1] and [Figure 2]]. The amount of force applied at the beginning was 150 g for both elastic chain and closed coil spring and was measured using a tension gauge. GCF samples were collected using #25 paper point (Sendoline, Sweden). The samples were collected at the buccal sites of the Maxillary canine gingival sulcus before the force was applied and at 7 days after. Day 7 was chosen because day 7 is the turnover time for enzymes. Teeth were isolated with cotton rolls, cleaned of any plaque deposits, and gently drained using air jets to exclude the remaining saliva. A paper point was inserted 1 mm subgingivally for 30 s. The collected samples then were stored in sterile tubes at −80°C until biochemical analyses were assayed. A blinded biochemist at Clinical Pathology Laboratory, Faculty of Medicine, Universitas Gadjah Mada performed the GCF cytokine measurement. After thawing at room temperature, stored GCF samples were assayed in duplicate for human TNF-α and TGF-β1 by enzyme-linked immunosorbent assay according to the manufacturer’s instructions (Finetest®, China). Optical density (OD) was measured on a plate reader using 450 nm wavelength. A standard curve generated from the OD values of standards provided by the manufacturer was used to determine cytokine concentration. The amount of each biomarker was determined in picograms/millimeter (pg/ml). TNF-α and TGF-β1 levels data were subjected to a test of normality and homogeneity. Paired t-tests were used to compare cytokine levels at the different time points in which samples were taken from the patients. The differences between the groups at a time interval were compared by independent t-test. A P-value of <0.05 was considered statistically significant. Statistical analyses were processed with the Statistical Package for the Social Sciences version 20.0 software (SPSS Inc., Chicago, Illinois, USA). All the participants maintained good oral hygiene throughout the study. There were no inflammatory clinical signs of gingival and periodontal status. The descriptive statistics that include mean, standard deviations, minimum, and maximum value of TNF-α and TGF-β1 levels of this study are listed in [Table 1]. The independent t-test showed no statistically significant difference was detected for TNF-α (P = 0.365) and TGF-β1 (P = 0.109) levels in GCF before the canine retraction between the elastic chain group and the closed coil spring group. However, at 7 days, significantly higher values of TNF-α (P = 0.036) and TGF-β1 (P = 0.002) were determined in the closed coil spring group. The paired t-test showed that there were significant increase in the levels of TNF-α and TGF-β1 at 7 days in both retraction groups compared to before canine retraction [Table 2]. This study intended to observe the levels of TNF-α and TGF-β1 in GCF during canine retraction movement and to compare the efficiency of orthodontic force generated by elastic chains and closed coil springs by measuring the cytokines changes. TNF-α is a proinflammatory cytokine that is involved in bone resorption and acute as well as chronic inflammations. Even though TNF-α is produced primarily by activated monocytes and macrophages, it can also be produced by osteoblasts, epithelial cells, and endothelial cells. In-vitro studies have demonstrated that in bones, TNF-α can directly and indirectly induce osteoclastogenesis by binding to its p55 receptor on osteoclast precursors and by upregulating the expression of receptor activator of nuclear factor-κB ligand (RANKL), Macrophage-colony stimulating factor (M-CSF), and other chemokines on osteoblasts. TNF-α is also an apoptotic factor for osteocytes, which could be the signal for osteoclast recruitment to resorb bone in the PDL pressure side, at the same time inhibiting osteoblasts., TGF-β1 is a multifunctional cytokine produced by a variety of cells, including osteoblasts and mechanically stimulated fibroblasts and has highly osteogenic properties, and increases osteoblast activities. Further studies have showed TGF-β1 effects on pressure sites after an orthodontic force application and it is an essential factor for RANKL-induced osteoclastogenesis and, consequently orthodontic tooth movement. Neither TNF-α nor TGF-β1 is the sole factor that explains the process of bone remodeling; however, these cytokines are available in GCF and considered useful tools for studying cellular response to mechanical stress, in vivo. The results of this study demonstrated that in both elastic chain group and closed coil spring group, there were significant increase in the levels of TNF-α and TGF-β1 at 7 days compared to before canine retraction. The finding was similar to previous studies.,, The results implied that the force applied to a tooth induced an acute inflammatory response of the cell within the periodontal tissue which was characterized by the release of inflammatory cytokines. The released cytokines may interact either directly with bone cells or indirectly with neighboring cells such as fibroblasts, monocytes, and lymphocytes, and trigger the bone remodeling process. However, Basaran et al. reported that the increased mean concentration of TNF-α was not statistically significant compared to the baseline. Furthermore, a decrease was found between the last stage of the leveling and the starting stage of the distalization period which also differs from our study. The finding might be due to the large variation of individuals, the amount of load applied, and the type of material used to generate force in the study. The levels of TNF-α and TGF-β1 were found to be significantly higher in the closed coil spring group than the elastic chain group at 7 days after the force applied. It could be explained that the closed coil springs still exerted force throughout the study period whereas the elastic chains had large force decay. Kishorekumar found that NiTi closed coil springs lost less than 10% capability of force delivery after 7 days activation. Cox et al. also showed that the force decay of NiTi closed coil springs was approximately 12% after 4 weeks of clinical usage. On the other hand, in-vitro study by Mirhashemi et al. showed that the percentage of force loss of elastic chains ranged from 12 to 40% after 7 days. In another study, Sen and Goswami examined the force decay properties of elastic chains from four companies, with the maximum degradation found in plastic chains (American Orthodontics®, USA), which was 46.23%. The reason why polyurethane elastic chains had large force decay was due to a composite series arrangement of hard and soft domains of polyurethane structure when they were stretched. The results also implied that closed coil springs may have greater effect than elastic chains when cellular activity is considered, and alveolar bone resorption may be greater in the closed coil spring group than in the elastic chain group. This implication was supported by the study of Dixon et al. that showed the mean rates of space closure were 0.58 mm/month for elastic chains, and 0.81 mm/month for NiTi closed coil springs. Furthermore, a recent study by Chaudhari and Tarvade also demonstrated that a significantly faster space closure was achieved by using NiTi closed coil springs when compared to the elastic chains although with more anchorage losses. The results concluded that TNF-α and TGF-β1 levels were found to be positively correlated with the rate of tooth movement. NiTi closed coil springs gave higher rate of canine retraction than elastic chains. The study also demonstrated an important clinical implication, which was even though closed coil springs are an expensive option for space closure, they have the advantage of being efficient. In contrary, elastic chains are cheaper, but an increased number of visits is required to obtain the same amount of space closure. This study has shown that TNF-α and TGF-β1 are associated with the bone remodeling that occurs during canine distalization movement. Closed coil springs give higher TNF-α and TGF-β1 concentrations which make more bone remodeling to occur; therefore, closed coil springs can be considered as the treatment of choice. This study was supported by Dana Masyarakat of Dentistry Faculty, Universitas Gadjah Mada, Indonesia in the fiscal year of 2017 No. 4618/KG/PP/2017. Alhasyimi AA, Sunarintyas S, Soesatyo MH. Pengaruh Implantasi Subkutan Logam kobalt kromium sebagai bahan alternatif mini screw orthodontics terhadap reaksi jaringan kelinci albino. MKGI 2015;1:94-101. Shpack N, Davidovitch M, Sarne O, Panagi N, Vardimon AD. Duration and anchorage management of canine retraction with bodily versus tipping mechanics. Angle Orthod 2007;78:95-100. Ahrari F, Jalaly T, Zebarjad M. Tensile properties of orthodontic elastomeric ligatures. Indian J Dent Res 2010;21:23-9. Omidkhoda M, Rashed R, Khodarahmi N. Evaluation of the effects of three different mouthwashes on the force decay of orthodontic chains. Dent Res J (Isfahan) 2015;12:348-52. Dixon V, Read MJ, O’Brien KD, Worthington HV, Mandall NA. 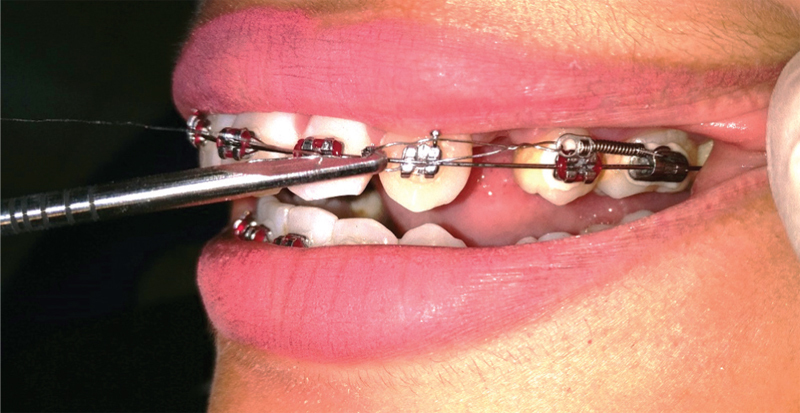 Randomized clinical trial to compare three methods of orthodontic space closure. J Orthod 2001;29:31-6. Alikhani M, Alyami B, Lee IS, Almoammar S, Vongthongleur T, Teixeira CC. Saturation of the biological response to orthodontic forces and its effect on the rate of tooth movement. Orthod Craniofac Res 2015;18(Suppl 1):8-17. Andrade I, Taddei SR, Souza PE. Inflammation and tooth movement: The role of cytokines, chemokines, and growth factors. Semin Orthod 2012;18:257-69. Andrade I, Silva TA, Silva GA, Teixeira AL, Teixeira MM. The role of tumor necrosis factor receptor type 1 in orthodontic tooth movement. J Dent Res 2007;86:1089-94. Barbieri G, Solano P, Alarcon JA, Vernal R, Rios-Lugo J, Sanz M et al. Biochemical markers of bone metabolism in gingival crevicular fluid during early orthodontic tooth movement. Angle Orthod 2013;83:63-9. Alhasyimi AA, Pudyani PS, Asmara W, Ana ID. Locally inhibition of orthodontic relapse by injection of carbonated hydroxy apatite-advanced platelet rich fibrin in a rabbit model. Key Eng Mater 2017;758:255-63. Kapoor P, Kharbanda OP, Monga N, Migiani R, Kapila S. Effect of orthodontic forces on cytokine Ana receptor levels in gingival crevicular fluid: A systematic review. Prog Orthod 2014;15:1-21. Karacay S, Saygun I, Bengi AO, Serdar M. Tumor necrosis factor-α levels during two different canine distalization techniques. Angle Orthod 2007;77:142-7. Castroflorio T, Gamerro EF, Caviglia GP, Deregibus A. Biochemical markers of bone metabolism during early orthodontic tooth movement with aligners. Angle Orthod 2017;87:74-81. Basaran G, Ozer T, Kaya FA, Kaplan A, Hamamci O. Interleukine-1β and tumor necrosis factor-α levels in the human gingival sulcus during orthodontic treatment. Angle Orthod 2006;76:830-36. Nayak BN, Galil KA, Wiltshire W, Lekic PC. Molecular biology of orthodontic tooth movement. J Dent Oral Health 2013;1:1-6. Gokul K. Estimation of the level of tumor necrosis factor-α in gingival crevicular fluid and serum in periodontal health and disease: A biochemical study. Indian J Dent Res 2012;23:348-52. Zhuang QW, Zhang ZY, Liu GL, Fu ST, He Y. Transforming growth factor-β1/Smad/connective tissue growth factor axis: The main pathway in radiation-induced fibrosis of osteoradionecrosis? Dent Hypotheses 2013;4:122-6. Leethanakul C, Kittichaikarn C, Charoemratrote C, Jitpukdeebodintra S. Effects of Continuous and interrupted orthodontic force on interleukin-1β and interleukin-8 secretion in human gingival crevicular fluid. J Oral Biosci 2008;50:230-8. Garlet TP, Coelho U, Silva JS, Garlet GP. Cytokine expression pattern in compression and tension sides of the periodontal ligament during orthodontic tooth movement in humans. Eur J Oral Sci 2007;115:355-62. Masella RS, Meister M. Current concepts in the biology of orthodontic tooth movement. Am J Orthod Dentofacial Orthop 2006;129:458-68. Kishorekumar S. Force decay characteristics of NiTi closed coil springs at different time intervals. Biosci Biotech Res Asia 2014;11:219-22. Cox C, Nguyen T, Koroluk L, Ko C. In-vivo force decay of nickel-titanium closed-coil springs. Am J Orthod Dentofacial Orthop 2014;145:505-13. Mirhashemi AH, Saffarshahroudi A, Sodagar A, Atai M. Force-degradation pattern of six different orthodontic elastomeric chains. J Dent Tehran Univ Med Sci 2012;9:204-15. Sen A, Goswami A. Comparison of 4 brands of elastomeric chains based on time dependent force decay. IOSR J Dent Med Sci Ver IX 2015;14:2279-861. Christenson EM, Anderson JM, Hiltner A, Baer E. Relationship between nanoscale deformation processes and elastic behavior of polyurethane elastomers. Polymer (Guildf) 2005;46:11744-54. Chaudhari CV, Tarvade Daokar SM. Comparison of rate of retraction and anchorage loss using nickel titanium closed coil springs and elastomeric chains during the en-masse retraction: A clinical study. J Orthod Res 2015;3:129-33.